I pride myself on knowing something about the highways and the byways of piano music - both at home and abroad. However pride often comes before a fall! Nevertheless, I cannot imagine how I have got to the age I am, after many years of classical music listening, having missed the works of Eurico Tomás de Lima. One thing that life has taught me is that there is a wealth of music out there that demands to be explored: it is quite simply finding time and opportunity to do it. Firstly, I give a few biographical notes about the composer. Eurico Tomás de Lima was born in Ponta Delgada on the island of São Miguel in the Azores on 17 December 1908. He moved to Lisbon at an early age. He was born into a musical family - his father António was a violinist, conductor, composer and professor of music at the National Conservatory in Lisbon. Portuguese music is a specialised field with which I guess few in the United Kingdom will be totally conversant. It is therefore hardly surprising that de Lima’s piano and composition teachers at the National Conservatory are not even names to me. However, his music history teacher was a certain Luis de Freitas Branco (1890-1955), a well-respected composer who has made an impact outside of his native country. His symphonies are highly regarded: they have been recorded on the Naxos label. After an exemplary period of study in which he gained the highest academic award at the Conservatory, he assumed a career as a recitalist and composer. 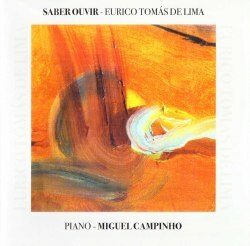 In 1932 Eurico Tomás de Lima gave his first major piano recital playing his own compositions. His career included concert tours including two major events in Brazil in 1949 and 1952. There were (apparently) numerous recordings for record companies, TV and radio stations in Europe and Latin America. He was a distinguished teacher and had posts in Oporto, Funchal and at the Academia de Amadores in Lisbon. The last part of his career was at the Calouste Gulbenkian Conservatory of Music in Braga from 1972-1978. Due to his ‘liberal’ political views, he was never preferred for any permanent music post in Portugal during the Salazar regime. No recognition was given to his achievement. As a composer, de Lima has written extensively for the pianoforte - especially solo works, but also including concerted pieces. There is also vocal and chamber music in his catalogue. Eurico Tomás de Lima died in June 1989 in the city of Maia. There are typically three groups of works represented here. Firstly, there are all four Piano Sonatas which were composed over a twenty-one year period. Secondly, there are two Sonatinas and lastly a couple of suites - ‘Algarve’ and ‘Ilha de Paraiso’ (Isle of Paradise). I suggest beginning with the two Suites. The first was composed in 1941, after a year with the ‘Cultural Missions of the National Secretariat for Propaganda’. At that time Portugal was a neutral country during the Second World War. During this period de Lima gave concerts across Portugal. The Suite is fundamentally poetic and late-romantic rather than in the more ‘modernist’ style of the Sonatinas. There are eight ‘picture postcards’ none lasting more than three minutes. Each is prefaced by a short commentary in the score which the composer insisted was read out before the performance of each piece. For example No.4 ‘Pota da Piedade’ has ‘With its kisses, the sea embroidered everything, There are here and there small and gentle grottos with crystals/With a childish appearance of children’s gift.’ I guess these words loose a little in the translation - but we get the idea. Some of these ‘pictures’ are very beautiful and drift towards a subdued impressionism. A contemporary reviewer suggested that the suite had a ‘well-worked out structure, large and vibrant inspiration, unique intuition for the descriptive genre, which requires, as we know, unusual sounds in its composition.’ The various movements ‘describe’ a majestic castle, impressive scenery, historical character, a ‘cubist’ village, gardens and waves. But do not take these allusions too seriously - just enjoy the music. This suite is in six movements and is infused with both the landscape and the traditions of Madeira. I guess the next place to explore is the two Sonatinas. These are more ‘modern’ in their style than the two suites leaning towards neo-classicism: the musical language is terse and concentrated. They are both full of interest and are not dry or ‘academic’. Francis Poulenc is possibly the referential marker to compare this music to. The first Sonatina in A major was composed in 1938 and is conceived in three movements. I found the ‘andante’ surprisingly reflective for a ‘little sonata’. The last movement is an acerbic ‘moto perpetuo’. The second Sonatina in C major was composed in 1950. The liner notes are correct in stating that de Lima has effectively squared the circle - he has ‘integrated the seemingly irreconcilable elements of classically-inspired form, romantic poetic lyricism, cosmopolitan modernism and dialogue with national folklore’ (folksong). Certainly, the second Sonatina has a confidence that transcends the limited scale of the work. The four Sonatas, define the composer’s achievement. The first was completed in 1933 and the last some twenty years later in 1954. The 1st Sonata in C sharp minor was written in Lisbon. It is clear that the composer was using the classical sonata form as the basis of his essay. De Lima even repeats the exposition in the first movement - which is a truly classical device. The ‘andante’ is a ‘long lyrical song’ of some considerable beauty. The last movement is a ‘pot-boiler’ - here there are nods to American ragtime and jazz. It is a superb conclusion. It is the romantic piano style of Chopin that dominates this music rather than Beethoven. Two years later, de Lima penned the Sonata No.2 in E minor. It is by far the longest piano work that he wrote. He dedicated it to his wife. De Lima has moved away from a rigorous classicism and utilises as more ‘sectional’ structure on the opening ‘allegro appassionato’. The second ‘subject’ is pure operatic fantasy. The Scherzo is regarded as ‘an amusement’ albeit a complicated and virtuosic one. The slow movement seems to have Beethoven as its model: this ‘andante cantabile’ is a quiet, restrained exploration of a variety of textures and pianistic devices. It is often brittle, but ultimately, warmly lyrical. The final rondo, an allegro impetuoso brings this striking sonata to a powerful and largely romantic close. The 3rd Sonata in A minor (1948 rev. 1963) is more like a sonatina in its short, concentrated format. Certainly, the composer has adapted a more ‘modernist’ style than his previous two exercises in the genre. This is not serial music, nor in any way ‘avant garde’. The general impression of the opening ‘allegro risoluto’ is of ‘aggressive music. Gregorian chant appears as one of the elements of this music which reminded me of Debussy. The second movement is quite dry in its effect -with a balance between chromatic and metrical explorations. The final movement is in complete contrast. This is pure virtuosic music written in a ‘bitingly modern style’ yet never too far from the more romantic exemplars such Liszt. Eurico Tomás de Lima’s 4th Sonata in F Major can be regarded as the ‘culmination of a musical voyage of discovery.’ The liner notes suggest that this Sonata has the same integration of disparate elements that are found in the 2nd sonatina -but applied on a much more impressive scale. Beethovian formal procedures, ‘romantic poetics’ and an edgy modernism, the use of folk song materials and a Lisztian virtuosity are keynotes in this work. The work was composed in 1954 and was the first work that the composer recorded for the National Radio in 1956. Included on these CDs are ‘Program Notes’ which are given in Portuguese (Disc 1) and English (Disc 2) It is essential listening to anyone interested in de Lima’s music. The sound quality of these two CDs is excellent. The liner notes are comprehensive, if a little crabbed in their translation from Portuguese. A brief biography of the pianist Miguel Campinho is available on his webpage. I enjoyed virtually every bar of this 2-CD set of Eurico Tomás de Lima’s piano music. Miguel Campinho is a most persuasive advocate for these works. As I mentioned earlier, it is hard to imagine how I can have overlooked this composer. I guess that is because he has not been extensively recorded before - at least out with Portugal. Furthermore it is hardly likely that de Lima will feature in many piano recitals in the United Kingdom.